Modular design approach allows our company to develop not only individual systems of any configuration, but to join them into a unified complex. The complex provides data readout of its every subsystem’s operation and parameters and controls them too. Our production is developed with the use of components made by foreign manufacturers. It provides high reliability and moderate price of our equipment in comparison with foreign counterparts. Scientific potential and professional skills of our design engineers and programmers enable our company to integrate its production into the systems of the leading foreign and domestic manufacturers. It’s especially important if You have already had such systems installed at Your unit and wish to improve them. Modern industrial units as well as dwelling houses and offices are highly saturated with complex engineering equipment. Today a growing number of uses are being found for the new technologies such as access control and video viewing, fire and intruder alarm, fire extinguishing, computerized systems of control over production process and those of public utilities. The problem of keeping such a complex infrastructure operating, its monitoring and control are of great importance nowadays. The optimal way to solve this problem is creating a united complex that could coordinate and control the operation of these systems. Specialists of “NANKO Co. Ltd.” have developed a new Dispatching-and-Monitoring complex. This complex integrates technical arrangements of unit protection (fire and intruder alarm, access control system, video viewing), computerized systems of production process control and those of public utilities control (ventilation, heating, water supply, conditioning etc.) into a united system on the basis of controllers and concentrators*. Data related with operation of the systems and their parameters are displayed on the operator’s monitor in a perception-comfortable way (such as animation, active mnemonic diagrams, oscillograms etc.). The complex works in line-operated mode as well as in self-contained one. Modular approach to the design of the Dispatching-and-Monitoring (DMC for short) enables our company to develop systems of any configuration according to the customer’s requirements as well as to integrate our production into the systems of the leading foreign and domestic manufacturers. The essential feature of integrated systems is that their subsystems work in coordination. They cooperate and share information with each other, which provides top-efficiency. The proposed complex can be applied at any unit ranging from a workshop to a plant, from a single building to a whole urban district or a town. 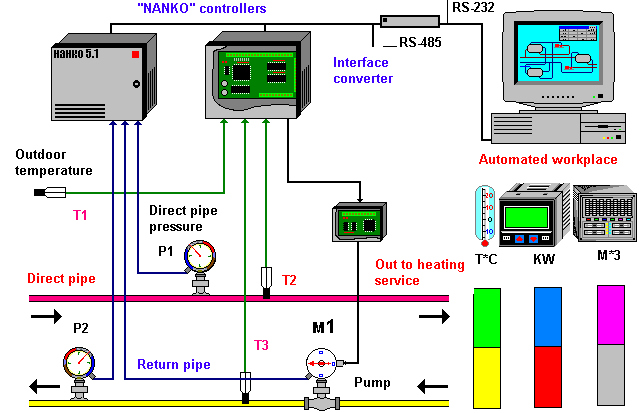 The production process control complex based on an instrumented control systems. Prevention of automatic or manual control actions which might initiate a hazard. These functions are normally provided by, alarm, protection (trip, interlocks and emergency shutdown), and process control systems. · moderate price in comparison with foreign counterparts. In practice the complex approach based on automation and dispatching of life support systems provides reducing costs on energy carries and maintenance service from 20 to 40%. the commercial account of consumed heat, and also the account of the consumed water on hot water supply. The separate account on each consumer is if necessary possible(probable). · the commercial account of the consumed water on each consumer and on all system. Automation of thermal points and boiler rooms, including on the industrial enterprises (the similar project is realized in Lensk, Yakutia) is possible. * Controllers and concentrators are electronic devices on the basis of microprocessor techniques. They are capable to accept input signals, to process them using complex algorithms, to transmit actuating signals to control devices, to transmit data through the network by the protocol RS-485 and connecting thereby with several computers (server – workstations). Workstations convert data into a comfortable for the operator format and then transmit them through the inner (ETHERNET) and the global (INTERNET) computer networks. Copyright NANKO Co. Ltd. 2004.